The moment you enter Uttarakhand, there is an amplified smell of rhododendrons and the eye-pleasing sight of the lovely deodars as you climb higher into the hills of the lovely Kumaon. Nestled in the lap of world’s highest mountain range – Himalayas, the attractive little Kumaon region depicts timeless beauty and eloquent grandeur. The region contains some of the most amazing mountain scenery: the stunning snow-capped peaks of the Greater Himalayas, the low lying hills of Nainital and Almora and the lovely foothills of the Jim Corbett National Park. Known as the Lake District of India, Kumaon is home to some spectacular lakes. These lakes with their quaint beauty and amazing backdrops have been attracting travelers, both domestic and international. So, let’s all take a tour of the lakes in Kumaon. 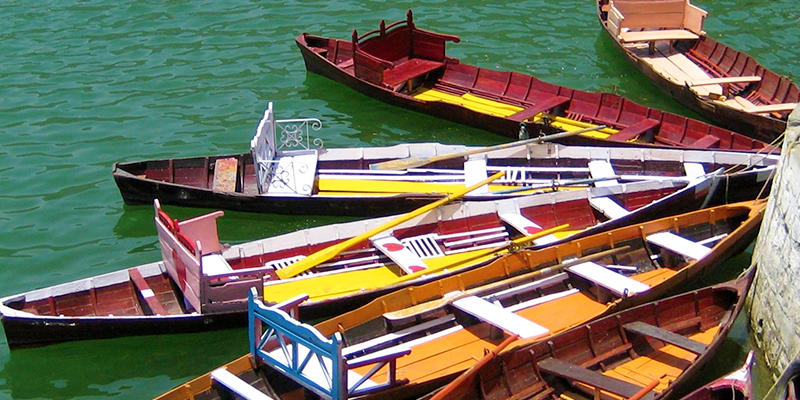 Nainital is one of the most eloquent and better known natural freshwater lakes in Kumaon. 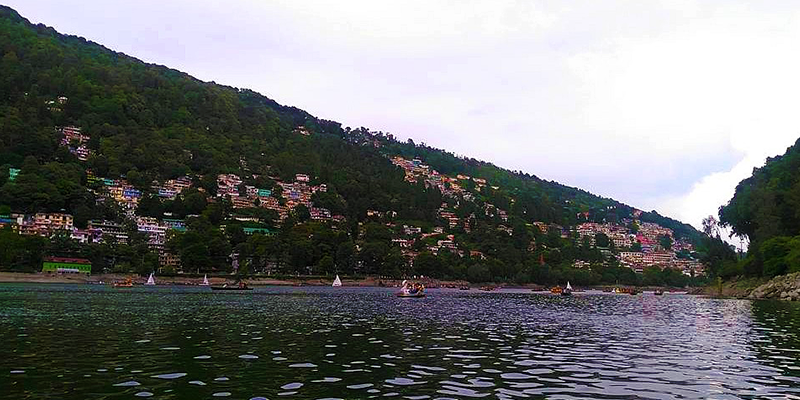 According to folklore, Nainital means (‘naina’ in Sanskrit means eye and ‘tal’ is lake) is one of the emerald green eyes of Sati (wife of Lord Shiva) which is believed to have fallen on earth after she self-immortalized herself. This kidney-shaped lake is one of the best lakes in the region. Its association with history and scenic sights nearby makes it a hub for tourists. Famous Naina Devi temple is situated at the far end of the Lake; you can take a stroll on the mall road on the right bank of the lake too. Viewing sunsets on the banks of this lake is a special attraction. Located in Bhimtal (the town named after one of the Pandavas from Mahabharata, Bhima), this C-shaped lake is the largest lake in Kumaon region. The lake, with elevated banks, has rows of cottages on the west end and amazingly terraced fields on the east. 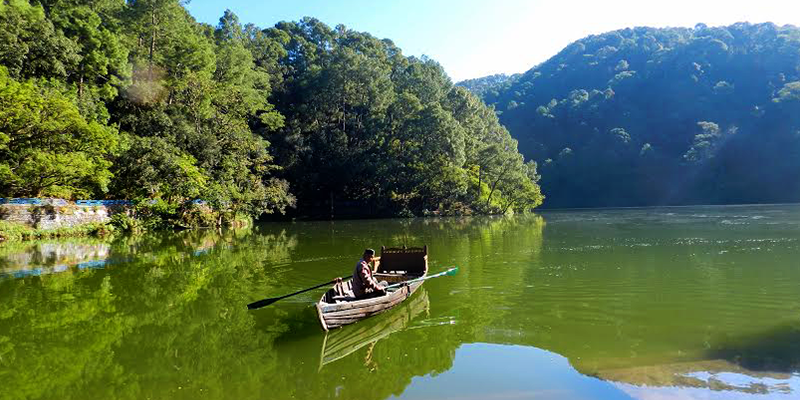 The lake catchment area has hills with dense forest cover comprising of pine, ban oak and a mix of deciduous flora. 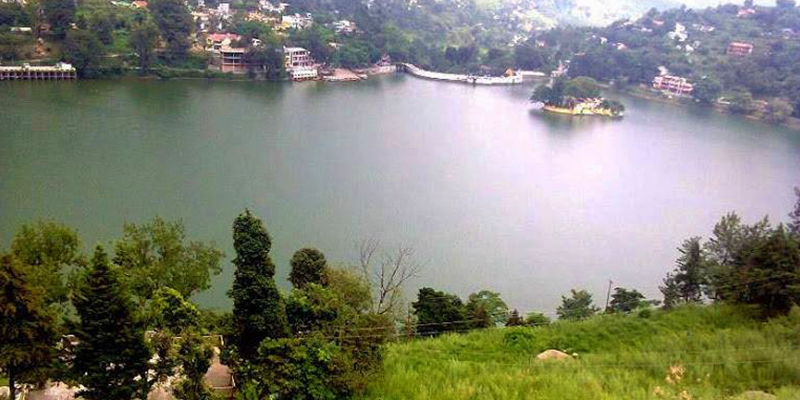 Another attraction of Bhimtal Lake is the rich variety of fish species that can be found in the lake. This beautiful lake has a small island in the middle of it. This island has become a significant tourist attraction and there is a huge aquarium built over this island for the tourist’s viewing pleasure. 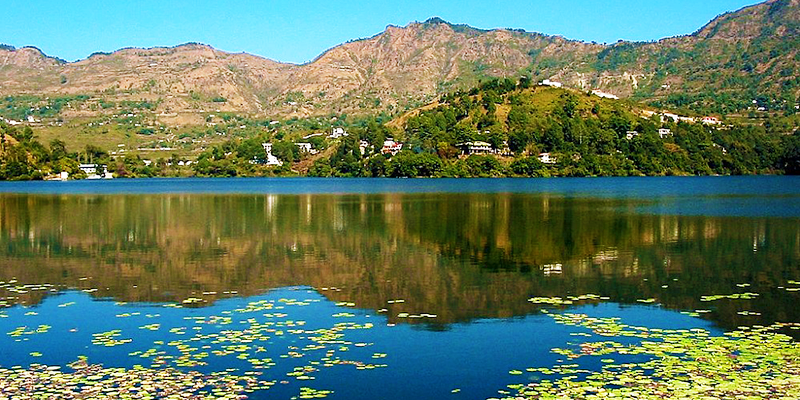 From this aquarium site you can enjoy the amazing surroundings of the Bhimtal Lake. NOTE: Before fishing in this lake, do take a special permission from the district collector. Naukuchiatal in local language means “Nine Cornered Lake”. Though much less known than its famous counterparts, the lake is gifted with scenic splendors of nature. Situated only 4 KM away from the Bhimtal Lake, the lake premises are covered with Deodar, Pine, Oak and various other shrubs. If you are adventurous minded then there are plenty of activities such as paragliding, rowing, paddling or yachting. Otherwise you can spend time bird watching or simply admiring the almost poetic beauty of this lake. Meaning “Seven Lakes”, this cluster of lakes are surrounded by dense oak and pine wood forests. If you are a nature lover, you will simply adore this destination. With lush forests, tranquility, greenish water and the sweet chirping of birds, this is virtually a paradise waiting to be explored. Situated 22 KM away from Nainital, this lake deserves to be in your must visit list next time you are in Uttarakhand.